Painting our models has been a great way for me to start learning NMM. The near-future urban setting has dictated the style of the models, which means the metallic bits are limited to a few small parts of the model, as opposed to many miniature lines out there that are composed of suits of armor, swords and shields, etc, which can be very daunting when you’re not quite sure what you’re doing. I’ve taken a few less successful stabs at painting NMM where I bit off way more than I could chew. This is my 3rd start on this model after starting over from black. If I ever have time to work on this model again I will probably start over again on everything but the claws. A model like above is exhausting and discouraging when you’re new to NMM. It gave me lots of opportunity to try stuff out but very little chance of feeling successful. Inevitably, I messed up large portions of the model and had to start over several times. It is much better to work on small chunks and make them successful, a dagger here, rifle there. Each small success gives me the confidence to try again and extend myself a little. Thug has a metal pipe, “Rusty”, as well as several small cybernetic implants that are metal. 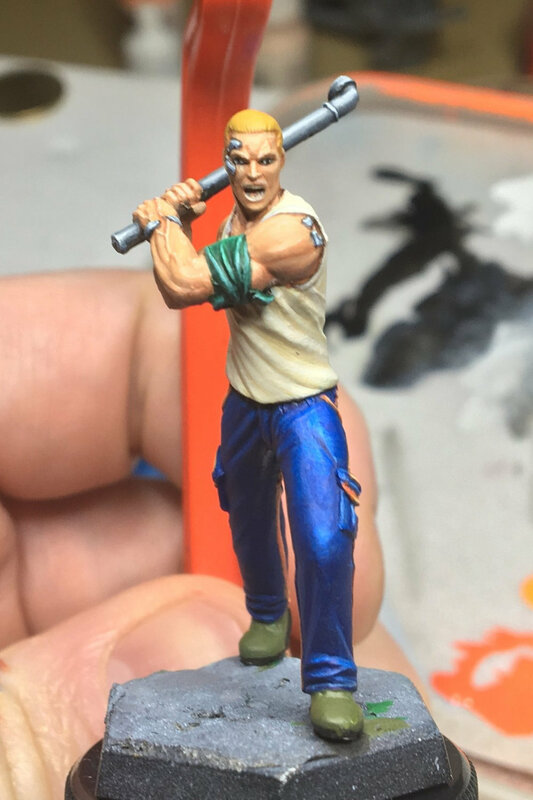 Here are some WIP shots of him. Keep in mind I will apply some corrosion and rust to the pipe so the final look will be much different, but I wanted to get that metallic look underneath. Nix has knives and knee pads that are dark metallic. 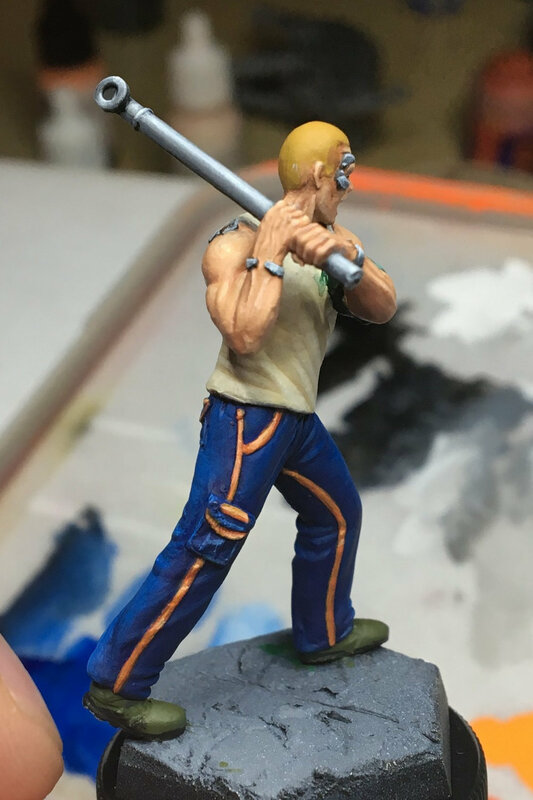 As for the “how” to paint NMM, I’m just a student but I’m starting to understand some of the advice i’ve heard over and over,. The most important is to look at things in the real world, pay careful attention to how light reflect off of real metal object. You start to develop an intuitive sense, especially a gut reaction when you look at something you’re painting that will tell you if you’re on the mark or not. That said, one of the most helpful pieces I’ve found on the internet is this video (thanks, Ben). He includes a great trick which is before you prime your mini brush some oil on the metallic party and then take some pictures of it with a strong light aimed from your intended fictional light source. The oil will make the surface super shiny and you can use the photos as a reference on how the light should lay on your model as you paint. Just the concept of doing this has helped me think about light and how it plays on objects in the world. How is my metal looking? What are your techniques for painting NMM? Older PostChimps, Elephants, and Bears. OH MY!